Battleborn is made by the same studio as Borderlands. The game offers fast paced action in short doses. The story campaign is the weakest part of the game, and hero design is the best. Battleborn, by Borderlands creators Gearbox, is simultaneously hilarious and annoying, extremely eye catching and visually drab, with exciting moment to moment gameplay that's still boring because of how repetitive it gets. That sounds pretty par for the course for Gearbox, but Borderlands was able to go beyond that with its insane combination of loot and huge skill trees. Does Battleborn also deliver more, or fall under the weight of its imperfections? Borderlands was the FPS take on a game like Diablo - lots of loot to collect, skills to upgrade, and hordes of enemies to kill. 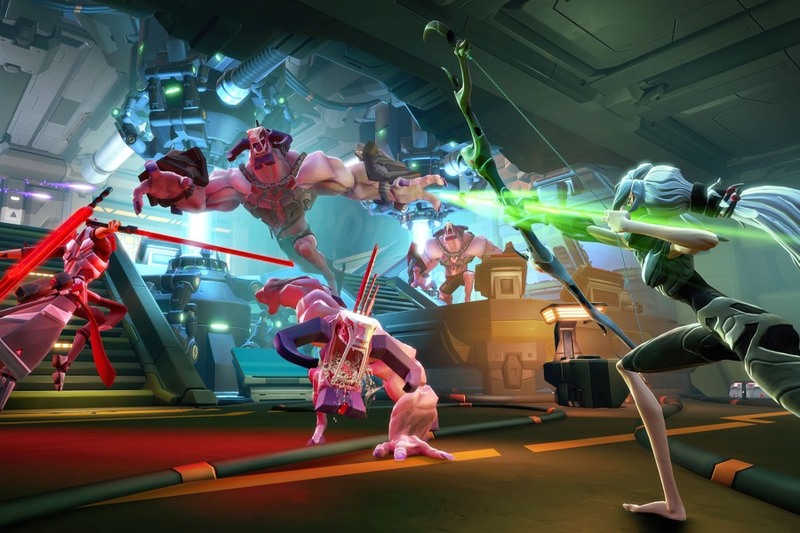 Battleborn brings the FPS treatment to League of Legends - short rounds of 10 - 30 minutes, where you face off against swarms of minions and enemy heroes, and take down the other team using your weapons and your skills. Instead of slowly leveling up your character over the course of hours of play, you quickly gain levels for your character during each match, unlocking abilities as you go along, and reset back to zero at the end of each match. The results don't always translate well - mobas (multiplayer online battle arenas) such as League of Legends are played with a top down perspective that gives you much more situational awareness than a first person shooter can. There were times when we were surrounded by minor minions that wouldn't have posed much of a challenge - if we could see them. Instead we turned into monster munchies. By and large though, Gearbox has done a good job translating the genre into an FPS, with a wide selection of heroes and abilities that are complemented by an interesting mix of levels. The good news here is that if you enjoyed Borderlands, there are a lot of shared genes in this game. It starts with the cartoon-y art style that's over the top, bright and cheerful. The different characters truly look unique, and if anything, look even more comic-like than Borderlands' heroes did. There's also a lot more variety, with two dozen different heroes to choose from - although, at the start of the game, you're limited to just seven of them. There are also loads and loads of groan-worthy puns and terrible jokes to remind you of this games' lineage, along with title cards that introduce boss monsters who are usually just horrible bullet sponges with little that makes them memorable - which is another thing Borderlands fans can probably relate to, if less cheerfully. 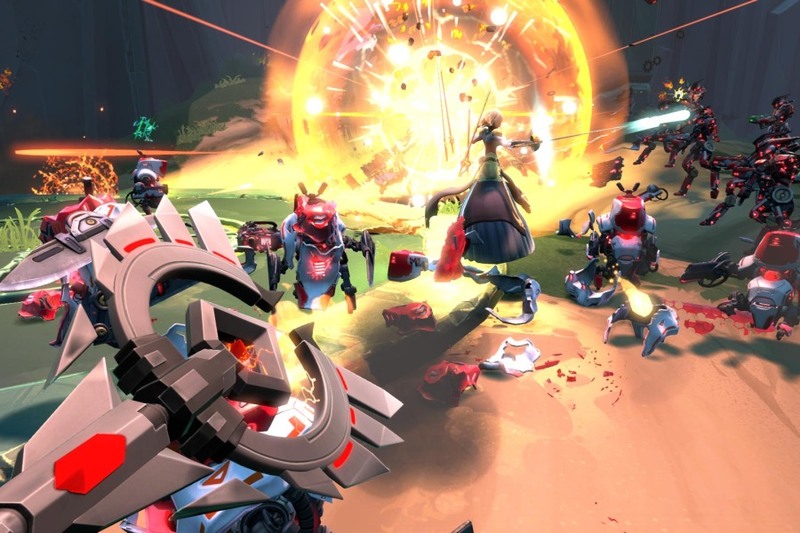 In Battleborn, there are two modes of play - versus other players (in three different game types), or the campaign mode, which you can play solo, or cooperatively with other players. In either case, the bare bones of the experience are similar - you start each map with a set of basic objectives; go there, kill that, and then go somewhere else and kill a bigger version of the thing you killed. You select your character (or hero, as the game calls them) before each mission, and they start at level one. Over the course of each mission (which can last between 10 and 30 minutes, depending on the game mode) you'll gain experience from killing your enemies, which raises your character's level. When this happens, just press the up-button on your D-pad to choose between one of two new powerups. You start each mission with your basic weapon and two fairly weak abilities, and as you gain levels, you will unlock all sorts of upgrades including a third, much more powerful ability. These different abilities (or skills, in the games' parlance) often interact with each other in interesting ways, and if you've got more than one person playing (either online, or on the same console using split-screen mode) then the different heroes powers can often complement each other nicely too. The abilities you unlock are only for the duration of that mission - you're starting fresh each time you play - but you can pick up some cool gear during missions, and this can be equipped on your character for boosts to your statistics in future missions at the cost of shards, the currency in Battleborn. These shards are also used to pay for defensive turrets, or hovering robots that will heal you or hurt your opponents, so a certain amount of strategy starts to enter the picture. Actually, that's one of the problems with Battleborn - you spend a lot of time thinking about how to fine tune the balance of your character. Which skills are best for what situation, time spent thinking about shards, and time spent thinking about cooldowns for skills, all demands a lot of your attention, and a twitchy first person shooter isn't perhaps the best place for this much tactical thinking. The good thing is that if you're playing with friends, the difficulty is much more manageable, as you have a much wider set of powers at hand when you're working together. The game rewards teamwork a lot, and if you're playing with someone whose characters abilities and playstyle complement yours, the game becomes hugely enjoyable. On your own, or with teammates whose skill level is a lot better (or worse) than yours, things are an unbearable slog. The campaign, which took us around nine hours to finish (dying often) has some extremely enjoyable missions that are worth replaying. It also has a few that are just really badly designed, and will make you want to quit the game from frustration. There is enough variety in the levels that you need to try out a number of different heroes. The experience of playing as the different heroes is also quite enjoyable. The variety isn't limited to their designs - there is a lot of variety in the powers and weapons they come with, and this means that choosing different heroes for the same mission can completely change the experience. For example, the bowler hatted sniper robot Marquis can be devastatingly powerful, but his weaponry requires a more careful and precise style of play. While Oscar Mike starts off as a generic space marine, through upgrades you can turn him into a precision killer, or buff him up to spray bullets in every direction. Walking mushroom Miko is an fun character to play as with healing powers to help out the whole team, but if you're playing by yourself, it can be challenging because his direct attack options are limited. WIth a wide variety of characters to choose from, this is really great, though a lot of these characters are actually locked at the start of the game. You unlock four of them by completing the campaign, and then you'll unlock the rest by playing the game online and this is a long, slow slog as well. The unlock system feels like it's taking forever - after a dozen hours of play, most of the heroes will remain locked, and you're going to have to spend a lot of time playing online if you want the full range of heroes at your disposal. Another thing we didn't like the game was the storytelling for the campaign - there really isn't much of a story to speak of, and the way it's told leaves a lot to be desired too. Overall, the story feels like an afterthought. In the multiplayer modes, Incursion mode takes around 30 minutes, and features minions and bases, making it most like a Moba. Capture is a lot more like what you'd see in typical FPS games, as you fight to control different points in the map - these games usually last around 10 minutes each, and the back and forth on the missions makes it one of the most enjoyable ways to play the game. 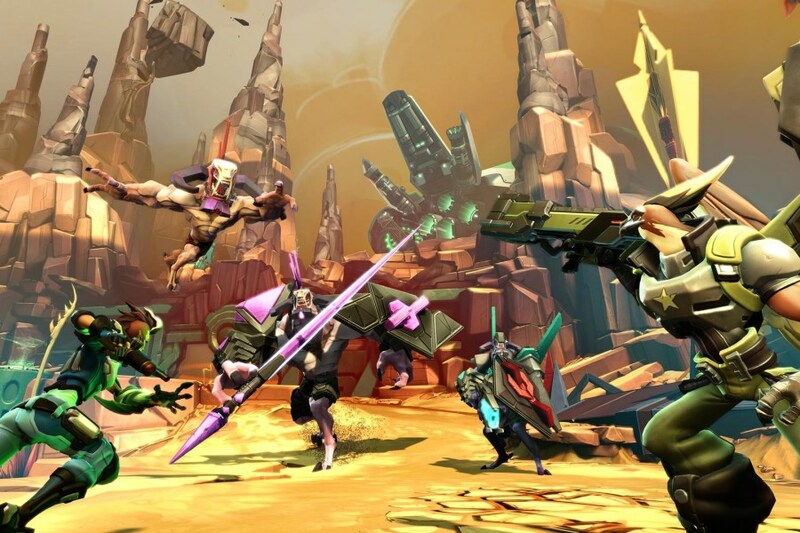 Overall, Battleborn is an enjoyable action game that has some flaws, but is nonetheless fun to play, mostly thanks to its impressive roster of characters. Moment to moment gunplay is fun, as is the variety of powers you get, and if you're playing with friends, the game can be really enjoyable. Playing online wasn't an issue - there were some instances of lag that were frustrating, and a few times our character glitched through a wall or into a floor, but these issues did not crop up very often. Playing split-screen with a friend in the same room is obviously the most fun. If you have the option, don't play this game alone. That's a great way to dislike Battleborn. There is no real loot to collect, and the story is threadbare. It's about having fun with friends and strangers, and if that does not appeal to you, then this game is not likely to please. No story to speak of. Not much fun to play alone. We played a retail copy of Battleborn on the Xbox One. The game is available for the PS4, Xbox One, and Windows PC. It costs Rs. 3,499 on consoles, Rs. 999 on PC. It is available in stores and online. 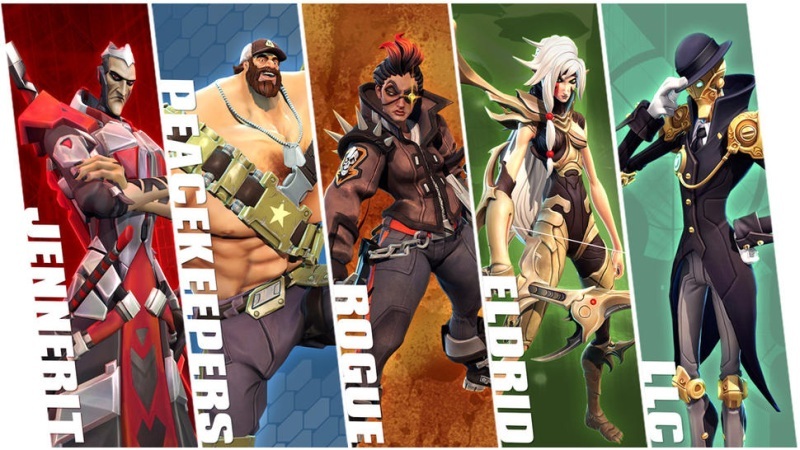 product Battleborn promises to dazzle you with 24 heroes who offer completely different styles of play. We find out if that's a good thing.